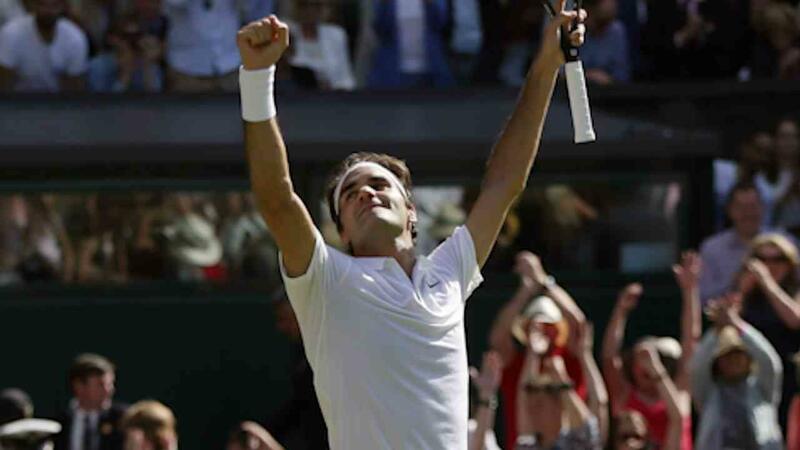 Roger Federer put his global army of "Fed-Head" fans through the wringer for four nerve-shredding sets before he kept alive his pursuit of a record eighth Wimbledon title with a 6-7(4) 4-6 6-3 7-6(9) 6-3 win over Marin Cilic the quarterfinals on Wednesday. Novak Djokovic's shock third round exit had raised hopes that this could be the week when the Swiss finally ends his four-year hunt for an 18th grand slam title, as the Serb had been the only man to beat him at the majors over the past year. However, all those expectations appeared to be heading for the dustbin as Cilic stood one point away from victory -- not once, not twice but three times in a pulsating fourth set that had everyone on the edge of their seats. Three huge serves kept Federer alive -- just -- and he then produced the kind of form, and outrageous shots, that has made him the most successful man in tennis by stealing the tiebreak 11-9. An ace on his first match point finished off the job and carried him into an 11th Wimbledon semifinal, and 40th overall in the majors. He will face another big-server, Canadian Milos Raonic, for a place in Sunday's final.